Includes the use of the reception hall for one hour. It includes tables and chairs, paper napkins, paper plates and nuts, mints and punch will be served. We set up and break down and clean up for you. **Please put amount of people attending this is required to have the correct amount of food and staff. Includes 2 hours in the reception hall: tables and chairs,table cloths, paper products, nuts, mints, punch, finger sandwiches, vegtable and fruit trays, potato chips, coffee and tea service. **Please put the proper amount of people attending this allows us to provide enough food and staff. ** Include children 4 and up. The price includes set up and breakdown and clean up. Includes Reception hall for 3 hours with tables, chairs, chair covers, table cloths for black tie setup, linens, silver, plates; choice of two hot horderves and 2 cold horderves, along with nuts, mints, punch, finger sandwiches, vegtable and fruit treys and potato chips and dip. This makes a nice display. Prices includes taxes and gratuity for servers. Set up, break down included. Includes 3 hours in reception hall: Tables, chairs, chair covers, sashes for black tie set up, linens, silverware, plates, glasses, full buffet with 2 meat choices, startch, 2 sides, salad and coffee and tea service. Gift Table will be set up and cake table at request. Nuts mints and punch will also be included. Please include the proper amount of people attending ages 4 and up. Specialty items for children can be ordered and price will be adjusted. This is a combination of reception 3 and 4 includes 4 hours in reception hall: Tables, chairs, chair covers, sashes for black tie set up, linens, silverware, plates, glasses, full buffet with 2 meat choices, startch, 2 sides, salad and coffee and tea service. Gift Table will be set up and cake table at request. If you are supplying your own champagne please let us know so we can provide ice buckets. Nuts mints and punch will also be included with some cold and heavy hordouvers. Please include the proper amount of people attending ages 4 and up. Specialty items for children can be ordered and price will be adjusted. 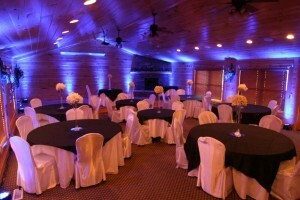 Add Custom Catering by "From the South to Your Mouth"
Located in the Beautiful Black Bear Ridge Resort and specialize in wedding receptions, get-togethers, corporate events and private meetings, prepared cabin delivery and lunch boxes. 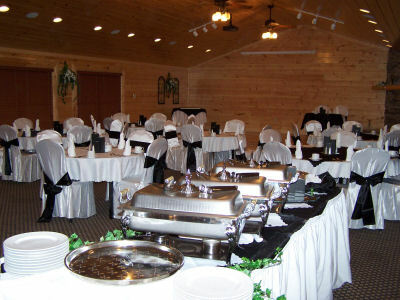 We are here to prepare for any of your occasions. 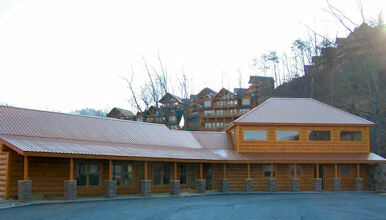 We have some suggestions, but if you would like to personalize your event call 865-365-0918. Here is a sample menu. If you do not see an item that you would like to include, please let your wedding coordinator know so that we can look into adding it to the menu. Choose TWO of the following to compliment the items above. 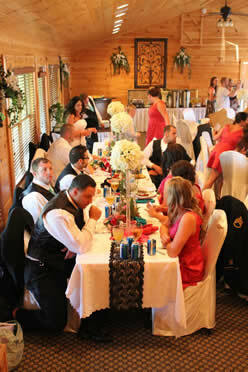 Add a little life to the party with one of our themed rehearsal dinners. Choose 2 meats, 2 veggies, 1 salad, and 1 starch for your reception from this menu. ROLLS, WHIPPED BUTTER, COFFEE, and TEA accompany all entrees. Appropriate Vegetables & Starches will be served to accommodate each dish. A large stuffed Burrito topped with a zesty Enchilada Sauce. Served with Spanish rice, sautéed peppers and onions. Fresh Stir-fried Vegetables seasoned with an Oriental Sauce. Served on a Bed of Rice and topped with Chow Mein Noodles. Served with fried Egg Rolls and oriental sauces. With Imported cheeses in a zesty sauce. Served with a Starch & Vegetable. Provolone cheese & Parmesan Cheese. Served over a large bed of pasta.